Здесь представлена вступительная статья (эссе) к пятой главе каталога, сопровождавшего выставку работ художника эпохи Возрождения Фра Анжелико (15 век) в Музее искусств Метрополитен в Нью-Йорке в 2005 году. Автор статьи - Лоуренс Кантер (Laurence Kanter) - Главный куратор Галереи искусств Йельского университета, в 2005 году бывший исполняющим обязанности куратора Коллекции Роберта Лемана в Музее Искусств Метрополитен в Нью Йорке. The third and final chapter of Fra Angelico's career opens with a painting regarded by some as the artist's greatest masterpiece, the Coronation of the Virgin altarpiece (fig. 74) from San Domenico, Fiesole, now in the Musee du Louvre, Paris. 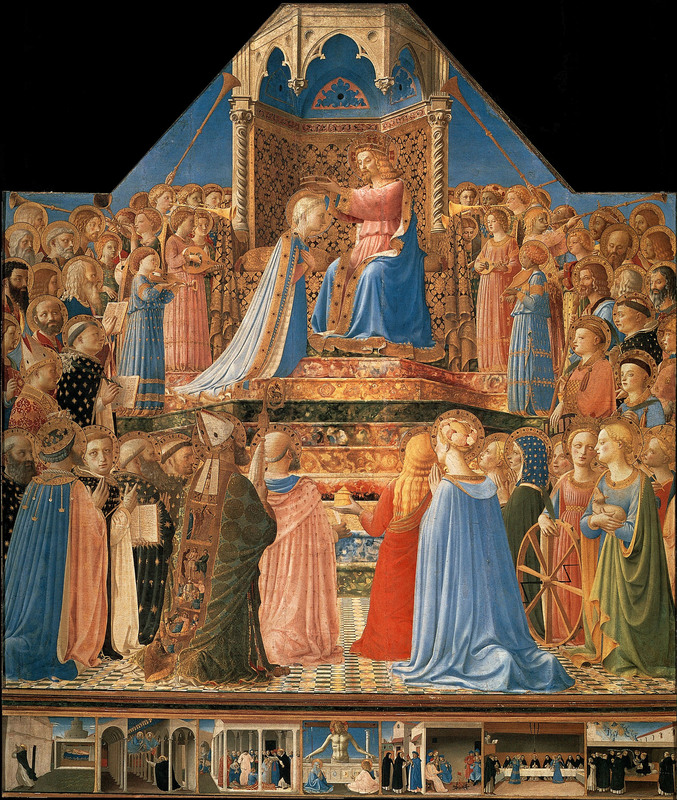 The Louvre Coronation is so sophisticated in its spatial structure that John Pope-Hennessy was led to conclude that it must be dependent upon the example of Domenico Veneziano's paintings of the 1440s, and, therefore, that the complexity of its figural arrangement and decorative details must be typical ofAngelico's latest works. (*1) Other scholars, however, have recognized that it was probably completed before the formal consecration of the church of San Domenico in 1435; on the basis of its figure style alone it is most likely datable to the years between 1432 and 1434. 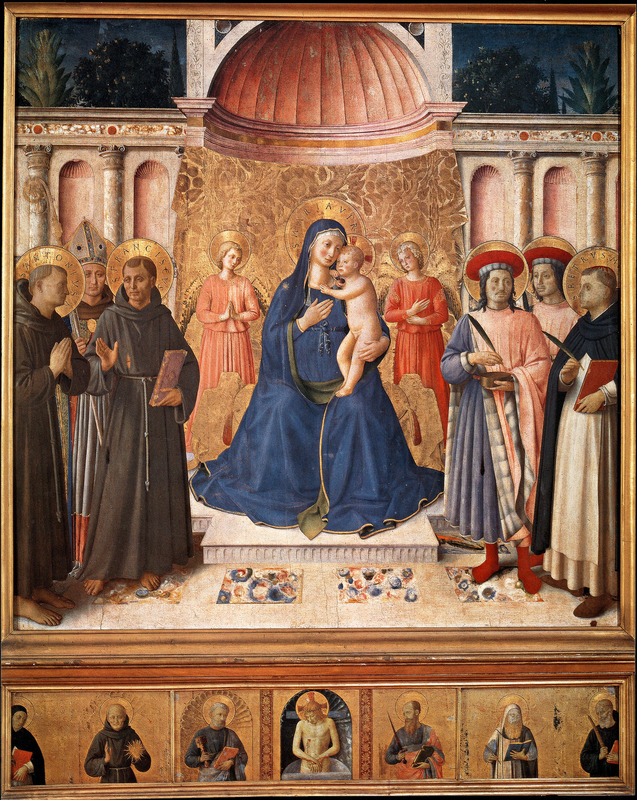 Thus, the nature of its relationship to such paintings as Domenico Veneziano's Saint Lucy altarpiece, or Filippo Lippi's Barbadori or Sant'Ambrogio altarpieces, needs to be reformulated, acknowledging that the compositional novelties of this painting — its exceptionally low viewpoint; its faultless, sweeping perspective; the foreground occupied by saints seen almost completely from behind — are all inventions of Fra Angelico, designed by the artist to situate the worshiper within the fictive space of the mystical event he has portrayed. The intellectual component of the illusion is reinforced by the breathtaking precision and abundance of veristic detail throughout the painting: the pleats, ripples, textures, and gilt ornament of the saints' robes; the patterns of the steeply foreshortened floor tiles and the brightly colored marble steps of the dais; and the strings, bridges, sound-hole carvings, and belled tubes of the angels' instruments are perhaps matched in their accomplishment — taking into account all of European painting in the first half of the fifteenth century — only by the altarpieces of Jan van Eyck in Bruges and Ghent. The predella to the Louvre Coronation of the Virgin recounts six episodes from the life of Saint Dominic with, at the center, an image of Christ as the Man of Sorrows: it is the first complete series by Angelico, so far as is known,(*2) of scenes from the legend of the founder of his order. Following the example of the main panel of the Cortona Annunciation altarpiece, each scene is oriented parallel to the picture surface, opening out at one side with a steep diagonal recession into depth. The third scene, Saint Dominic Raising Napoleone Orsini, is set in what is essentially a replica of the painted architecture of the Cortona Annunciation. The last three scenes — the Miracle of the Book, Saint Dominic and His Companions Fed by Angels, and the Death of Saint Dominic — are in part derived from earlier experiments on the Saint Francis (cat. 24) and Saint Lucy (cat. 25) predellas but also anticipate the designs of the Linaiuoli (cat. 29) and Guidalotti (cat. 30) predellas later in the 1430s, as well as of the Orange Cloister frescoes painted at about the same time by Angelico's studio (see pp. 291-94). The initial predella scene, the pope's vision of Dominic supporting the crumbling walls of the Lateran Basilica, continues a tradition descended from Giotto's frescoes of the legend of Saint Francis, at Assisi, where a similar episode in the life of that saint is portrayed; it established an iconographic prototype from which even Angelico himself hardly strayed in two later versions of the subject (see cat. 37). In many ways the most remarkable of the predella scenes — Dominic's vision of Saints Peter and Paul inside the Vatican basilica — is unprecedented in its aggressive spatial effects and sophisticated interior lighting. 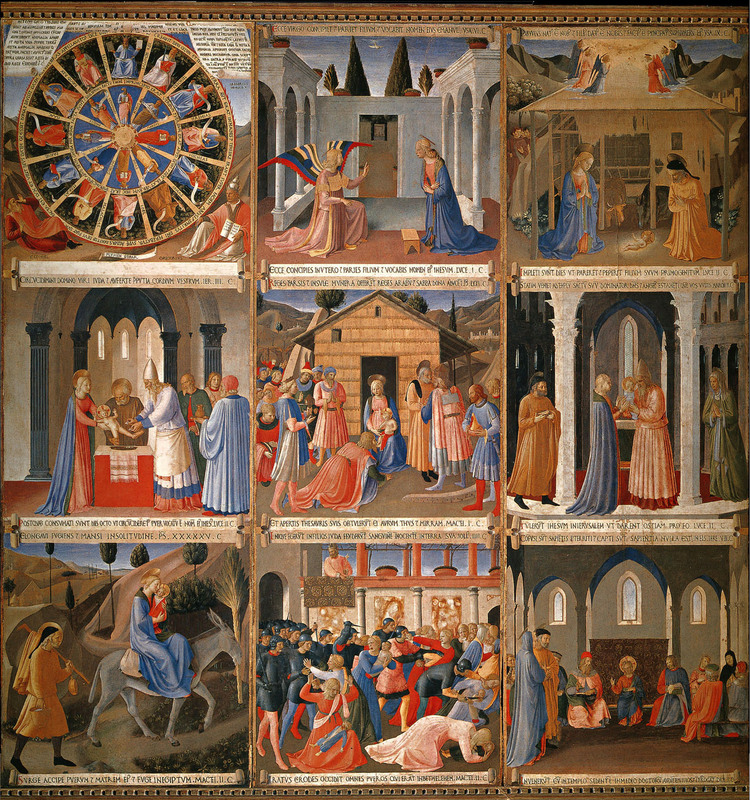 In this episode, and again in the fourth one, depicting the Miracle of the Book, it is not only the mathematical precision with which the architectural perspective is realized but the palpable density and temperature of the atmosphere and the tireless attention to minute, realistic details that set Angelico apart from (and ahead of) any painter among his contemporaries in Italy. 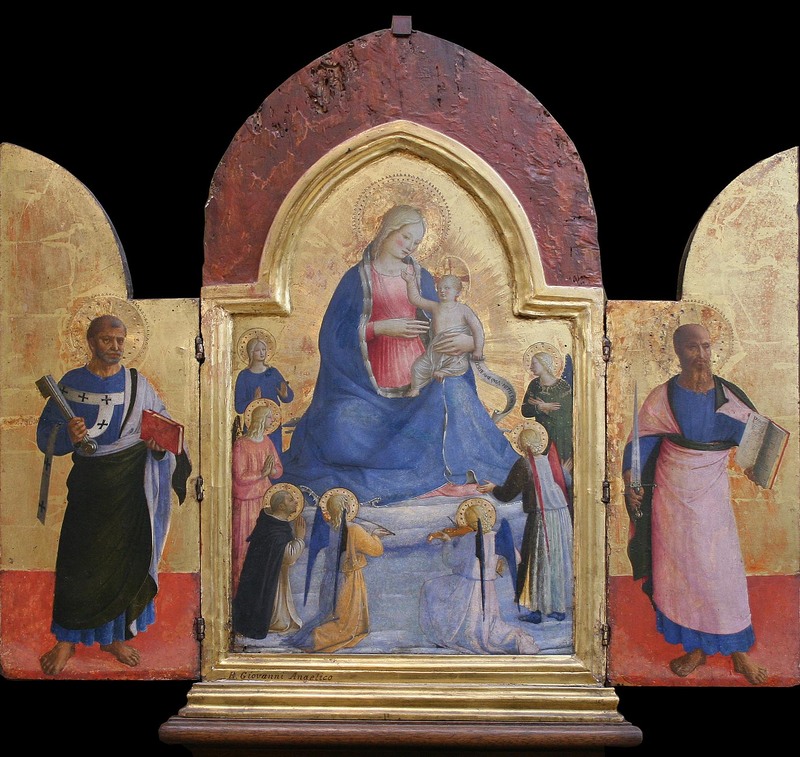 Although radically different in scale, only one other work by Fra Angelico incorporates a spatial structure similar to that of the Louvre Coronation of the Virgin altarpiece and approaches the same obsessive level of naturalistic detail: the small Dormition and Assumption of the Virgin in the Isabella Stewart Gardner Museum, Boston (cat. 28), the last of four reliquaries painted by the Dominican master for Santa Maria Novella, reputedly commissioned by Fra Giovanni di Zanobi Masi (d. 1434). Following shortly after these two works, Angelico produced a painting that is perhaps a compromise between them, both in size and in the blending of compositional ideas: a small altarpiece of the Coronation of the Virgin formerly installed on the rood screen in the hospital church of Santa Maria Nuova in Florence, and now in the Galleria degli Uffizi (fig. 75). The elaborate throne and stone canopy of the Louvre altarpiece are eliminated, as are the flight of colored marble steps, the intricately patterned floor tiles, and any other indication of physically measurable space. Instead, the artist evokes the celestial realm encountered in the upper half of the Gardner panel, densely populated here not only by a ring of dancing and music-making angels but also by ranks of saints — none of them seen entirely (and indecorously) from behind — deployed along radiating orthogonals with Christ and his mother at their focal center. Where the former is panoramic in vision, brightly lit, teeming with veristic detail, and almost exuberant in the activity of its cast of numerous characters, the latter is somber and severe in mood; its landscape setting is spare, distilled only to descriptive essentials; and the emotional pathos of its subject is emphasized by positioning the saints and beati, who enact the scene, in the foreground, close to the picture plane, and minimizing the importance of their placement in rational, measurable space. Again, differences such as these might be attributable to variables in context or patronage, but it is difficult to escape the impression that they are also intrinsic to Angelico's maturation as an artist. While perhaps the result of a natural trend in his thought processes, it is altogether possible that this development in Angelico's style was precipitated — or at least facilitated — by the experience of creating the remarkable series of frescoes in the cloister, chapter house, and dormitory corridors and cells at the newly restored convent of San Marco, the works for which he is undoubtedly best known today. Angelico was no stranger to the peculiar technical demands of fresco painting when, about 1438, he began this massive project — analyzed in detail by Magnolia Scudieri elsewhere in this catalogue. In addition to a standard training in the medium that he undoubtedly received as a young man,(*4) he could boast of previous experience in the fresco decoration of San Domenico in Fiesole and San Domenico in Cortona, as well as of a role in the design and perhaps overseeing the frescoes in the Orange Cloister at the Badia Fiorentina (see pp. 291-94). None of these projects, however, entailed the need, which Angelic() encountered at San Marco, to invent a new, reductive vocab-ulary of symbolic and meditative imagery, nor did they present the restrictions of format and picture-field size imposed by the dormitory cells there. The contrast between the spare aesthetic of the San Marco frescoes and the almost irreverent decorative excesses of Angelico's later frescoes in the Cappella Niccolina at theVatican (1447-48) could hardly be more exag-gerated, yet the compositional principles that underlie these two disparate series — as well as most of Angelico's late panel paintings — are fundamentally the same. 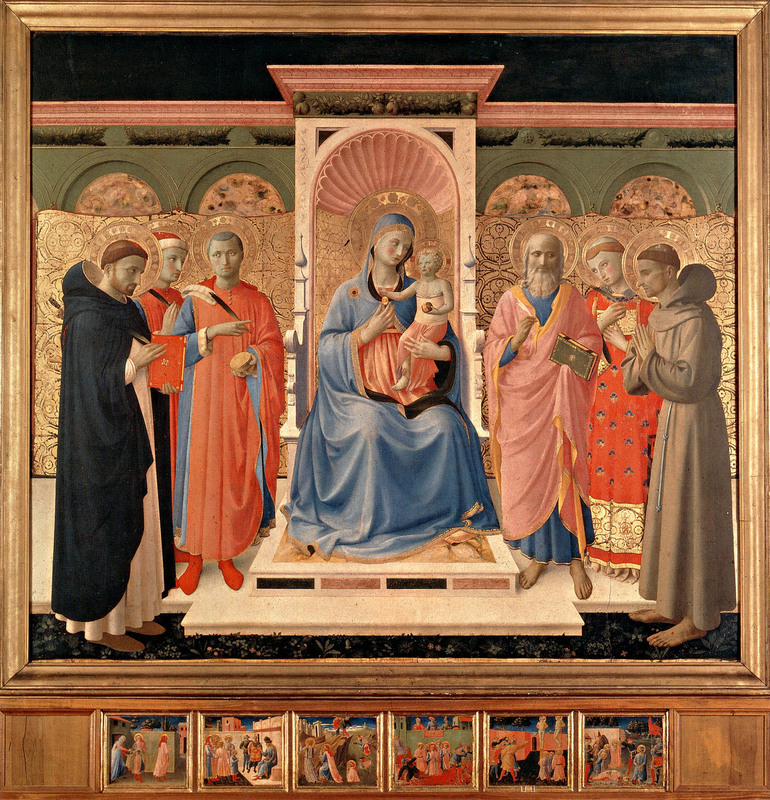 The campaign to embellish San Marco with frescoes and a new high altarpiece was so consuming a task and represents so complete a caesura within Angelico's career that it is not inaccurate to mark the date of the formal dedication of the church and convent — January 6, 1443 — as the beginning of the artist's late period. The last twelve years of his life also constitute the only truly peripatetic period of Angelico's career: although he is documented in Cortona in 1438, he can otherwise scarcely be shown to have journeyed far from his home convent in Fiesole until he moved to Rome in 1445, back to Fiesole in 1449 (having also traveled for work to Orvieto in 1447 and Florence in 1448), and in 1453 to Rome once again, where he died on February 18, 1455. It is also a period in which he devoted more time to the responsibilities of conventual administration than had previously been required of him, having been elected prior of San Domenico in Fiesole for two years, beginning in the summer of 1450. Most of the major projects that occupied him in Rome at this time, many of which do not survive, are described by Carl Strehlke in his essay in this catalogue, and others that he undertook in Florence can be briefly touched upon here. It is interesting to note what might be deemed a change in Angelico's working habits in this period: he can be credited with having painted only two altarpieces in this entire twelve-year span, a fraction of his output in any earlier period in his career. At the same time, the complex nature of the fresco commissions he accepted constrained Angelico to employ a large number of assistants — notwithstanding his frequent travels and relocations — and, perhaps inevitably, much of the work of these assistants became increasingly autonomous over the years. Alongside the San Marco andVatican frescoes, the locus classicus for discussions of Angelico's dependence on assistants in his late works has become the three large panels with scenes from the life of Christ that were painted to decorate a reliquary cupboard — known as the Armadio degli Argenti — for the church of Santissima Annunziata in Florence, now in the Museo di San Marco (fig. 73). According to contemporary tradition, the commission for these panels, received from Piero di Cosimo de' Medici, has been assigned to the year 1448,(*5) although this date has frequently been disputed since Angelico was presumed not to have returned to Florence from Rome until the following year, and work on the ceiling of the chapel that housed the reliquary was not completed until 1451. The uneven state of preservation of the panels, furthermore, has led to almost as wide a variety of opinion regarding the authorship of individual scenes, and of the extent of Angelico's contribution to their design or execution, as have the frescoes at San Marco. That more than one artist contributed to this series is clear simply from a comparison of figure types between scenes — as, for example, those in the Presentation in the Temple and the Circumcision. Which scenes were painted by Angelico himself, whether they were all designed by the master, who his assistants might have been, and whether the work was protracted over an extended period of time all remain open questions. It does seem possible to suggest, however, that the first panel (fig. 73) — comprising scenes from the Infancy of Christ, from the Vision of Ezekiel through the Dispute in the Temple — might have been painted somewhat earlier than the other two, possibly during Angelico's brief return to Florence from Rome in 1448, when he may have been accompanied by Benozzo Gozzoli (see p. 306), and, in turn, that it may have been Gozzoli who was at least in part responsible for several of its images. This hand does not reappear in the other two panels, which, additionally, are far more uniform in conception and quality of execution. Whatever had been the previous relationship of Gozzoli and Angelico, documents inform us that they worked together in Rome with the legal status of partners rather than as master and assistant. It is not surprising, therefore, to find Angelico scholarship preoccupied with attempts to isolate Gozzoli's work among the Cappella Niccolina or Orvieto frescoes, following the assumption that he participated in both contexts more as an equal and independent contributor than as an amanuensis. Fewer attempts have been made to recognize panel paintings produced at this time that might further reveal the nature of the collaboration between the two artists, but two such works must be the double-sided desco of the Virgin and Child Enthroned and the Volto Santo (cat. 36), now divided between the Museum of Fine Arts in Boston and a private collection, and a little-studied triptych in the Ashmolean Museum, Oxford (fig. 77), representing on its center panel the Virgin and Child Enthroned, with Angels and Saint Dominic, and on its wings Saint Peter and Saint Paul. This object has in the past been considered a pastiche, but physical evidence reveals that the three panels do belong together, having been only cosmetically altered with the reattachment of frame moldings to the center panel. The style, iconography, and unusual shape of this triptych all point to its having been painted in Rome, and the differences in quality of execution and compositional sophistication between the center panel on the one hand and the two wings on the other are the result of the latter being autograph works by Fra Angelico, while the former is very likely an all but independent effort of Benozzo Gozzoli. 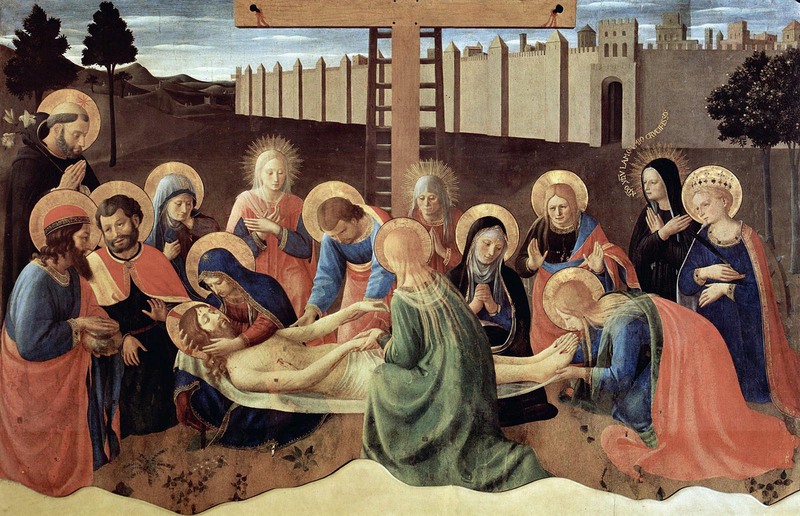 Vasari claimed that Fra Angelico painted an altarpiece of the Deposition for the Cappella Niccolina at the Vatican,(*6) as well as the high altarpiece and another altarpiece of the Annunciation for the Dominican convent church of Santa Maria sopra Minerva in Rome (see cat. 37). None of these can be certainly identified with a known work of art, however; the only late altarpiece by Angelico that survives nearly intact(*7) was painted for the Franciscan Observant convent of San Bonaventura at Bosco ai Frati in the Mugello (fig. 78), a Medici dependency close to Cosimo's villa at Cafaggiolo. Probably commissioned by Piero rather than Cosimo de' Medici — judging from the inclusion of Saint Peter Martyr alongside Saints Cosmas and Damian on the main panel — possibly on the occasion of the convocation of the General Chapter of the Franciscan Observants at Bosco ai Frati in 1449, the predella of this altarpiece includes an image of Saint Bernardino, who was canonized in 1450. Loosely following the format of the high altarpiece from San Marco (see cat. 34), or even more closely the fresco popularly known as the Madonna of the Shadows (fig. 127) in the upper corridor of the dormitory at San Marco, the most unusual feature of this painting is the exaggerated proportions and unexpected colors of the aedicula in which the Virgin's throne is set and of the architectural screen behind the standing saints. The warm pinks, bright reds, and soft blues of the marble structures and many of the complicated decorative motifs that enliven their surfaces derive from the fantastic architectural forms inserted in the background of the Cappella Niccolina frescoes, and reappear elsewhere in Angelico's oeuvre only in the so-called Annalena altarpiece also now in the Museo di San Marco (fig. 79). Although this last painting is frequently thought to have been commissioned by Cosimo de' Medici from Fra Angelico in the mid-1430s,(*8) there can be no doubt that it is, instead, con-temporary with the Bosco ai Frati altarpiece, and, like that work, was probably also commissioned by Piero di Cosimo de' Medici. 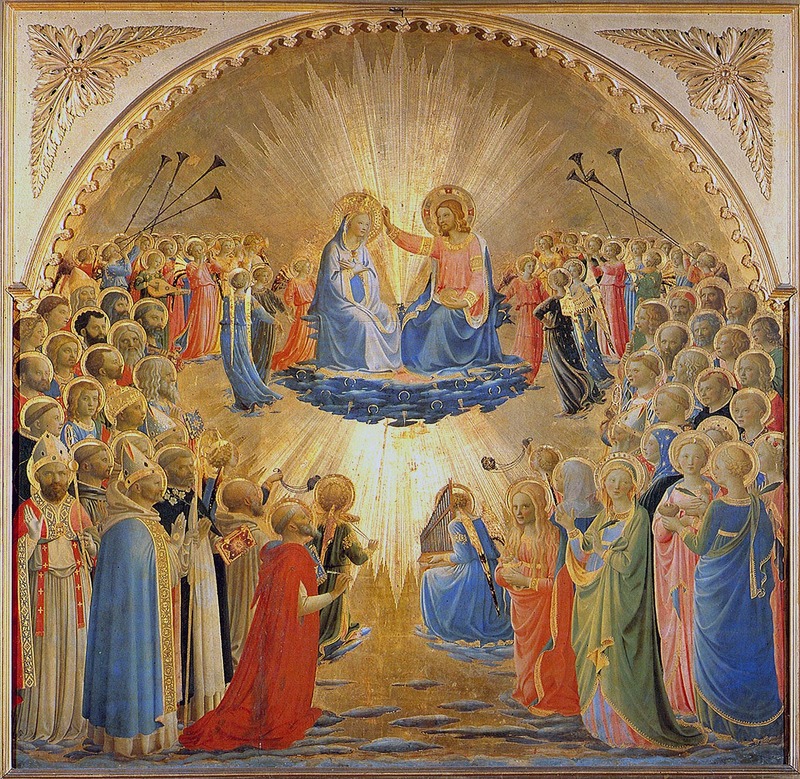 In the event, only the design of this painting may be attributed directly to Fra Angelico. Whether he never intended to execute it entirely by himself, or left it incomplete in 1453 when he abandoned Florence for his final trip to Rome, cannot be determined. It is clear, however, that the paint surface of this altarpiece, as well as the design and execution of all of its predella panels, are the work of Zanobi Strozzi: his last collaboration with the master for whom he had begun working over twenty years before. (*1). Pope-Hennessy 1974, PP. 34-35, 215-16. (*2). Two events from the life of Saint Dominic, his investiture and his birth, were depicted on the pilaster bases of the Cortona Annunciation altarpiece, probably painted about 1430-31. A scene of the investiture of Saint Dominic also appeared on the wing of a tabernacle triptych possibly painted for the Spedale di San Paolo in Florence, about 1427-28 (cat. 21), where it was undoubtedly accompanied by other episodes from the founder's life: as none of these survives, however, their subjects cannot be ascertained, although there may have been as many as five such scenes. (*3). See Bonsanti 1998, pp. 141-42.The altarpiece was commissioned on April 13, 1436, by Fra Sebastiano Benintendi, a descendant of the Beata Villana, who is portrayed in the painting, the second figure from the right. A payment registered on December 2, 1436, was once thought to indicate the painting's completion, but the date 1441, inscribed in mordant gilding on the hem of the Virgin's robe, is now recognized as the terminal date of the work. (*4). See Strehlke 20036, pp. 21-22. (*5). Cronaca di Firenze di Benedetto Dei, Biblioteca Nazionale, Florence, Cod. Magl. xxi, f. 96). (*6). This painting was hesitantly identified by M. Salmi (1958, p. 88) with a panel now in the National Gallery of Art,Washington, D.C. (1939.1.260), sometimes attributed to Jacopo del Sellaio. M. Boskovits (in Boskovits and Brown 2003, pp. 35-35), reaffirming an attribution to Angelico for the Washington Deposition or Entombment, acknowledged Salmi's suggestion that a Florentine provenance seems more likely than a Roman one for this work, but added that he "would not exclude the possibility that the panel was painted for the chapel in the Vatican!' It is conceivable that the fragmentary triptych wings by Angelico with the Pentecost and the Ascension, presently mounted alongside the Last Judgment in the Galleria Nazionale d'Arte Antica di Palazzo Corsini in Rome (see cat. 32), could have been painted as part of an altarpiece for the Cappella Niccolina, if Vasari's description of the subject of the latter is correct.They are complementary in iconography and congruent in date with the fresco decoration of the chapel. (*7). According to U. Baldini (in Florence 1955, pp. 88-90), the main panel of the Bosco ai Frati altarpiece was reduced by approximately twelve cen-timeters at either side — a loss that is sufficient to accommodate the missing half - length figures of Saints Dominic and Benedict cropped from either end of the predella. (*8). See Hood 1993, pp. 502-7, for arguments dating the Annalena altarpiece to 1434-35 and suggesting its original provenance from a Medici chapel in the church of San Lorenzo. Annalena Malatesta, a ward of Cosimo de' Medici, was widowed at the age of fifteen in 1441, and in 1450 she lost her only son to the plague. With Cosimo's support she obtained from Pope Nicholas V, on December 12, 1450, license to receive a cloistered community of Dominican pentitential tertiaries in her home. On August 4, 1452, she and twelve companions received the habit of tertiaries from Saint Antoninus, in a formal ceremony at Santa Maria Novella, and in June 1453 they moved into the premises that would later, in 1455, be consecrated as the Oratory of San Vincenzo. Angelico's altarpiece must have been commissioned in 1452 or 1453; the absence within it of any reference to Saint Vincent Ferrer, canonized in 1455, suggests that it must predate the reconsecration of the oratory to him, by Pope Calixtus HI, in that year. See Richa 1762, vol. X, pp. 128-40.